I’ve always loved the song Instant Karma by John Lennon. 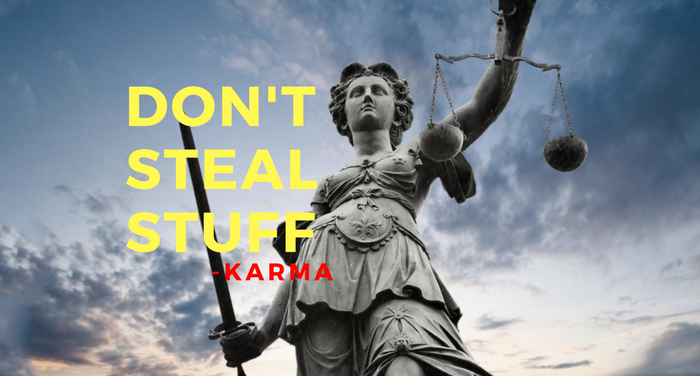 Karma is the concept of “what goes around comes around.” As described by Wikipedia, it’s the principle of cause and effect where intent and actions of an individual (cause) influence the future of that individual (effect). Good intent and good deed contribute to good karma and future happiness, while bad intent and bad deed contribute to bad karma and future suffering. Sometimes, it’s difficult to tell from just a couple conversations with someone, if they’re a good person or a bad person. That’s true in part because the bad person is doing their best to conceal their true identity and schemes from you. It’s also true because you perceive things through your own lens, which has been altered by your own predispositions, outlooks and biases. So, whenever there are two people communicating with each other under these conditions, there’s inherent margin for inaccuracy. Generally, my pre-set perspective is of assuming people are genuine, hardworking and have fair intentions. You’re probably the same way. At one point in my career, I was hired by the CEO of a small company. During the interview process, it was explained to me that the company was pioneering a breakthrough technology. They were building prototypes and planning more lab tests. However, after being hired I was told to have zero involvement in that effort, since it wouldn’t be commercialized until, “some point in the future.” Instead, I was directed to lead marketing and sales for their one other product that had been slow to gain traction. I’m going to be purposefully vague here, but over the next few months, suffice it to say I saw quite a bit of mismanagement and underperformance at the top level of the company. After several months I left. Hindsight has put the experience in the category of a consulting gig with bad management. The company isn’t listed in my resume or in my LinkedIn profile. I’d nearly forgotten about my time there. Then, years after leaving the company, I tried visiting its website. Zilch! I then searched for the company online, and up came articles describing how it had been closed; and the CEO had been convicted of tax evasion and was still on trial for allegedly defrauding investors. I was shocked. But not wholly surprised. I was not entirely surprised because of issues that became increasingly apparent during my time there. And there’s no shortage of other business, societal and political leadership misdeeds – Bernie Madoff’s Ponzie scheme, Volkswagen’s emissions scandal, the FIFA racketeering, fake Wells Fargo accounts, to remind us that greedy behavior is not rare. My predisposition still remains that people are generally well-intentioned and have the goodwill of others in mind. But, I realize that’s not always the case. I like the idea of karma. Of good guys and good gals coming out on top. It seems obvious that the goal every day, should be to get wiser and better. Live and love more. Start with yourself, and spread it out to your family, friends, colleagues and clients. We’re humans, and our history, albeit with an objectionable number of setbacks, is to advance towards improvement. So, onward we go trying to do the right thing. Hopefully making even a small contribution in the right direction. I think that’s what John Lennon meant. After reading about my ex-boss being on trial, I found the name of the detective investigating the case, and called him the next day.